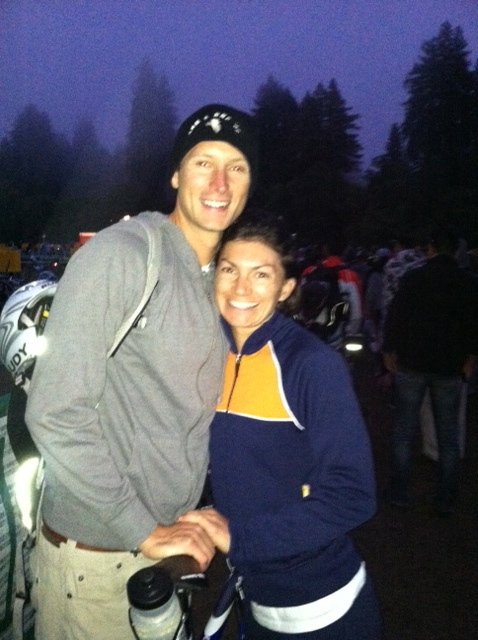 Last week was my first “A” race of the year, Vineman Iron Distance race in California. I had been looking forward to this race since Beach 2 Battleship last year and was anxious to see what last year’s heavy training did to bolster my fitness. Whit and I flew in to Sacramento on Thursday morning and made our way to Santa Rosa by 1pm, at which point we met both our parents for lunch. It’s comfortaing to have loved ones at races and/or calling to check in on your mindset leading in to a big race. I am lucky enough to not only have parents who care, but step parents who care, a brother and his family who care, and even a Grandmother who cares! This selfish sport would be a lot less fun without all of them. After lunch, putting our bikes together, and general race planning, we headed out to our B&B that was located in Guernville, CA, about 3 miles from the swim start and a couple hundred yards from Korbel’s vineyard. Friday warmed up a little but the high was still in the 70’s! We spent the morning doing our pre-race work outs then headed in to Windsor for packet pick-up and a race briefing. The crew with Vineman is incredibly organized and the whole registration process was seamless. When finished with preparing, we headed back to our place and I relaxed and prepared my mind for the next day. Race morning was glorious. It was cool and a mist was rising above the river, where we would swim two out and back loops for our 2.4 mile swim. the gun went off with out much glamour and we headed up river. There were places in the river where I could stand up and walk and the water came up to my knees. It was a strange sensation, but I took advantage of the situation and gave my arms a bit of rest. I checked my times at each turn around and realized that I was on track for my normal 1:15 swim, but I had hoped to be quicker. After the race I found out the swim was maybe 150 meters long, so I wasn’t too disappointed with my 1:14. I started the bike in about 30th position in my age group but quickly made it up to the front of the race. There were several groups I played “tag” with and finished the first 56 miles in 2:31. Perfect. It started warming up however and I realized the run was going to be blazing. The bike course at Vineman is beautiful. I loved it. There are rolling hills, flat sections, twists and turns, shade and sun. I was pretty happy with my first loop and decided to scale it back just a hair for the second lap and preserve my legs for the run. All was going well until mile 100 when I saw a guy about 100 yards up the road lock up his brakes. As I rounded the corner I saw several emergency vehicles blocking the road. When I arrived (second one to arrive) I was told that someone had crashed and fallen off the bridge, and that they were going to have to be life-flighted out. The run course is a 3 loop affair that is pretty hilly and provides little shade. The first two loops were going great. I was averaging just under 8 minute pace, and felt fairly good. (Video of me at mile 16) The start of the third loop, however, I started feeling rough. The temp was now in to the 90’s and the sun was relentless. My head felt dazed and I started throwing up fluids. I made it to about mile 18 and I knew I was in trouble. The ice and fluids were not doing me any good. I had cotton mouth but my stomach just wasn’t accepting fluids. At one point, I remember sitting on a guard rail wondering which direction I should go. Though my race was essentially over, I decided not to quit. Might as well finish what I started, even if it wasn’t ideal. The walk to the finish line was slow and a little scary. I felt dazed and confused. I crossed the line with a clock time of 11:33, but my race time excluding the stop was more around 11:18. I was immediately taken to the medic tent where I realized I’d lost 10.5 pounds and had a blood pressure of 70/50. I stayed there for maybe an hour while they cooled me off and, when my stomach settled, I rank a few gallons of chicken noodle soup. All in all, I am grateful to have had Whitney, my Father, Mary Ann, and Whit’s family there to take care of me. they were of incredible help, and I felt I owed it to them to at least laugh about the bad race and have some fun with them. But I am ready for revenge. Next up, Ironman WI!